Fall seems to have started early in the mid-Atlantic, so my 8-week-old little girl and I are definitely experiencing colder weather. Which means new methods to stay warm and new ways to carry her to athletic events (can’t take a stroller to either the football or t-ball fields). Last week I tested out the BabyHawk Baby Carrier to see if she was ready for it (which I reviewed in July). Instantly I could feel a balanced difference in my back. She cuddles so nicely inside and I’m very confident that she’s securely attached. The BabyHawk is now going everywhere with us–to preschool, t-ball practice, football games. I expect to start doing a lot less hauling the infant seat and a lot more using the carrier now that she’s in it. Last night was bath night. A pretty regular night in our home. But as I was wrapping baby girl up in her towel I reflected how useful and brilliant the CozyCare Cape is. It fits over my head while I bathe her, keeping me dry from little splashes. When the bath is over I can hold her against me and wrap her easily, no need to put her on the ground to dry her like I do with other towels. And when I get to the changing table, the CozyCare Cape is big enough to place her and the towel on the table and slip it over my head, never needing to unwrap her. This will make a great baby shower gift, I’m adding it to my list of must-haves for future moms. Read my review here. I love fall, I love the crisp air, turning off the A/C, football, crunching in the leaves. But I dread putting tights on her legs (its actually intimidating!) and, of course, want to dress her in cutesy dresses. I never realized the value of legwarmers until having a little girl. We now have about 8 pair (probably totally unnecessary to have so many, but I have to make sure she’ll match every outfit, right?) and we’re finding 2 brands we love: BabyLegs and Zootie. I also feel like they’re a good investment. They stay on her now but are very baggy and saggy, they’ll fit her much longer than and are far less likely to fray and tear tights would be. When I wake up at 6:30 for her morning feeding, I pull my hair back in a Cappucino by danielleloporto on etsy. Cappucino’s do the job of a do-rag or a bandana, in fact the look is pretty much the same. However Capp’s have a covered elastic wrap on the bottom, securing your hair without knotting it or stripping it, and it stays in for an extended period because the elastic keeps it in place. I’ve been wearing Capp’s while working out for a few years now, but never as much as I do now. Debbie reviewed the Clever Clip last spring and I knew that it was a product that I had to try. Now that the baby is obsessed with my hair and that I have yet to find the time to actually do my hair in the morning, the Clever Clip has become my absolute favorite accessory, next to my wedding band and engagement ring. It’s so simple to pull my hair up and out of the way and it looks good every single time. Do yourself a favor, be prepared for a bad hair day and get one now. I could not agree more. 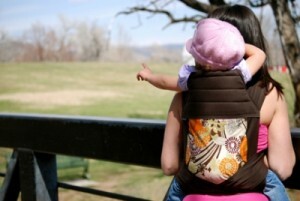 Mothering without a mei tai baby carrier would just not be the same. It makes life and bonding easier.